Description 3-Deazaneplanocin A hydrochloride is an inhibitor of histone methyltransferase. 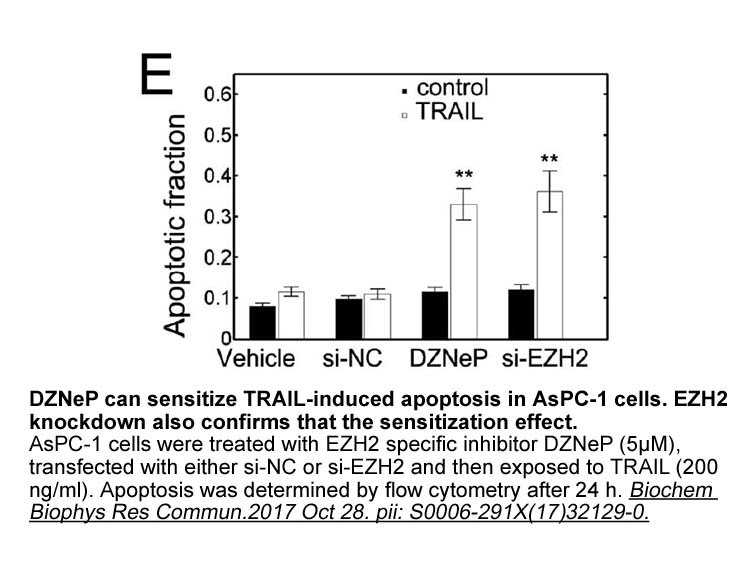 DZNep induced apoptosis in cultured and primary AML cells. 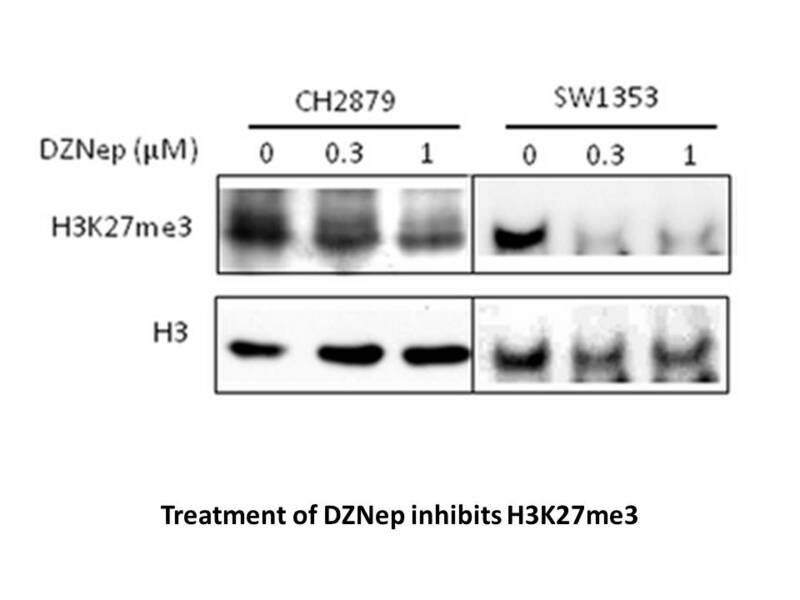 DZNep exhausted EZH2 levels, and inhibits trimethylation of lysine 27 on histone H3 in the AML HL-60 and OCI-AML3 cells. DZNep induced the levels of p16, p21, p27, and FBXO32 after cyclin E and HOXA9 levels run out. 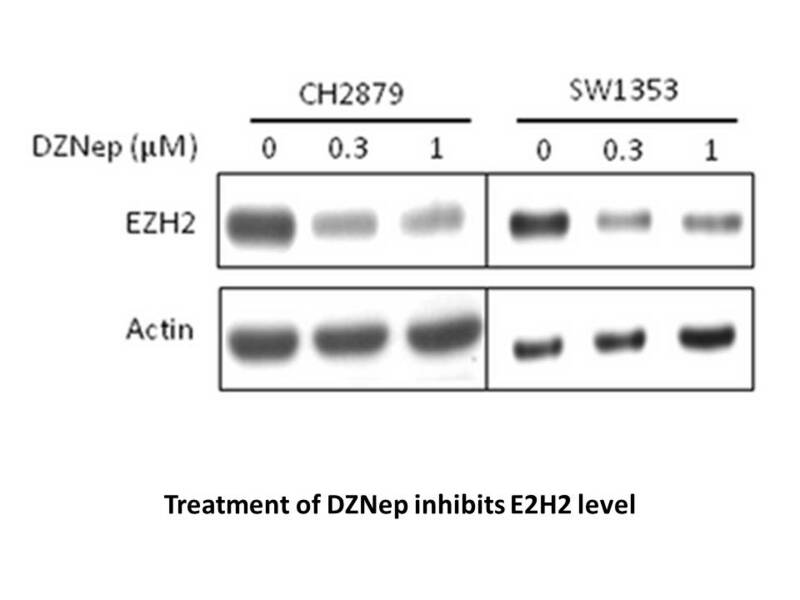 DZNep significantly reduced EZH2 expression and activity, and it increased lipid accumulation, inflammatory molecules and microRNAs in non-alcoholic fatty liver disease (NAFLD) mouse model. 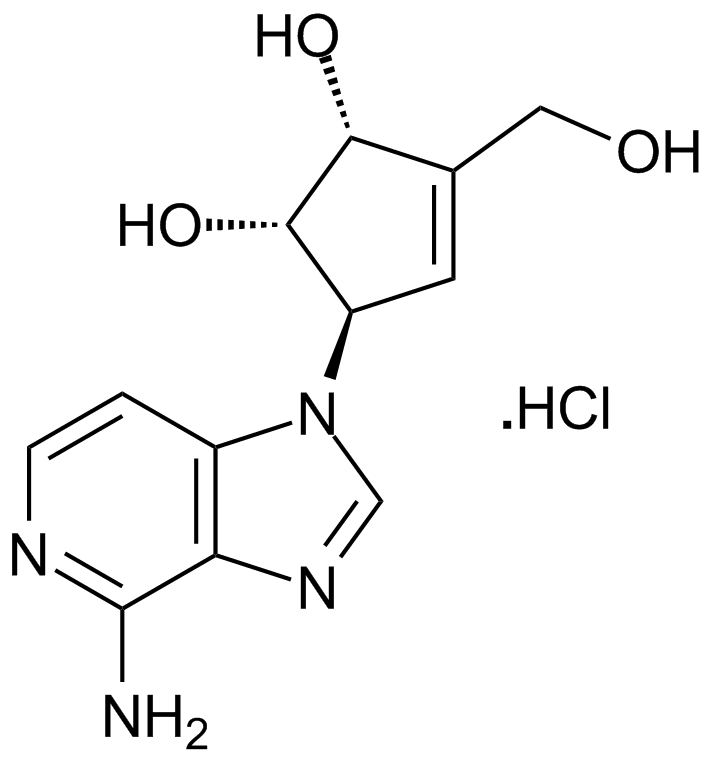 3-Deazaneplanocin A (DZNep) hydrochloride is a selective inhibitor of EZH2 inhibitor with IC50 value of 0.08-0.24 μM . ENZ2 is a sub-unit of PRC2 and plays an important role in regulating cell proliferation and cell-cycle progression. It has been reported that ENZ2 is over-expressed in many tumors, including prostate, breast, bladder cancers and AML . In HepG2 cell lines, DZNep treatment markedly induced the intracellular lipids increasement and TNF-αand TGF-βexpression in mRNA level by augmenting PA/OA-dependent lipid accumulation . DZNep is a potent ENZ2 inhibitor. When tested with human acute myeloid leukemia (AML) HL-60 and OCI-AML3 cell lines, administration of DZNep induced cell apoptosis by depleting ENZ2, cyclin E and HOXA9 expressions and inducing p16, p21,p27 and FBXO32 expressions in a dose-dependent manner . In high-fat/high-fructose diet fed (HFa/HFr-D) rat mouse model that resembles human NAFLD metabolically and histologically, DZNep functioned as the effective agent to anti-inflammatory and anti-fibrotic roles by inhibiting ENZ2 . It is also reported that DZNep has the inhibitory activity for (SAHH (S-adenosylhomocysteine hydrolase) with Ki value of 50 pM .
. Kikuchi, J., et al., Epigenetic therapy with 3-deazaneplanocin A, an inhibitor of the histone methyltransferase EZH2, inhibits growth of non-small cell lung cancer cells. Lung Cancer, 2012. 78(2): p. 138-43.
. Fiskus, W., et al., Combined epigenetic therapy with the histone methyltransferase EZH2 inhibitor 3-deazaneplanocin A and the histone deacetylase inhibitor panobinostat against human AML cells. Blood, 2009. 114(13): p. 2733-43.
. Vella, S., et al., EZH2 down-regulation exacerbates lipid accumulation and inflammation in in vitro and in vivo NAFLD. Int J Mol Sci, 2013. 14(12): p. 24154-68.
. Glazer, R.I., et al., 3-Deazaneplanocin A: a new inhibitor of S-adenosylhomocysteine synthesis and its effects in human colon carcinoma cells. Biochem Pharmacol, 1986. 35(24): p. 4523-7.